Many job seekers spend hours meticulously checking and re-checking their resume yet often over look the value of creating a flawless cover letter. More often than not, a resume’s cover letter will be the first piece of paper an employer will see as it is typically attached before a resume. A carefully sculpted cover letter is just another integral part of creating a stand out resume that will get noticed by employers of all kinds. Some people are convinced a cover letter should be an autobiography but it is important to keep in mind your audience. Most employers have little time to read through hundreds of resumes let alone drawn-out cover letters. Be sure to stick to the facts of your employment history, why you are interested in this particular position, and that you are available to talk as this is the purpose of your cover letter. Avoid including salary requirements or history as those can be deal breakers for an employer. These kinds of information can be saved for the follow up cover letter. Make sure you carefully create your cover letter layout. Remember that less is more! Hiring professionals do not want to feel overwhelmed but rather intrigued when viewing your cover letter. Long paragraphs and a high word count will make your cover letter too time consuming to read and your reader will become disenchanted. Stick to a short and sweet version by only including the MOST important details. Leave any additional comments for the interview. Avoid the generic cover letter jargon and be yourself. Be sure to research the company of which you are applying and include some relevant statistics and facts to show you have done your research. 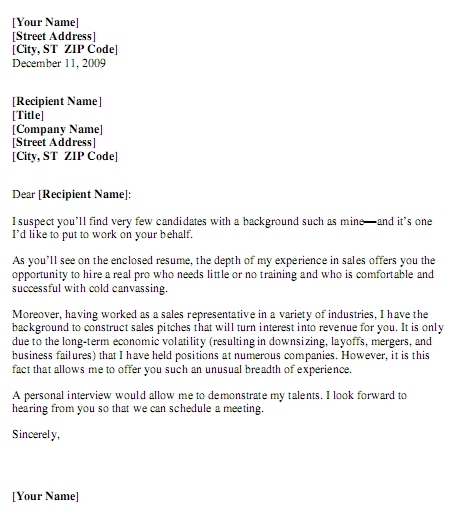 A cover letter with a personal touch will get noticed over a “cut and paste” version. This is your chance to hit your audience with what makes you different from all of the other candidates.